Chocablock Chocolate Studio at Corris Craft Centre01654 761617work Shop - FoodWe use only the best quality Belgian chocolate to produce an exciting and innovative range of chocolate products to sell. We aim to ring the changes throughout the year with seasonally themed creations. We now have a range of dairy free chocolates in different shapes and sizes. We also make a selection of delicious truffles and fudges. Try our new Halen Mon Anglesey Sea Salt caramel chocolate mmmmm. We use only the best quality Belgian chocolate to produce an exciting and innovative range of chocolate products to sell. We aim to ring the changes throughout the year with seasonally themed creations. 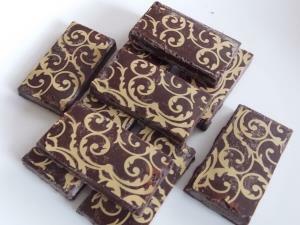 Have fun in the workshop making your own bar of chocolate using high quality Belgian chocolate. Use your creative skills to decorate your own unique chocolate bar to take away. Open daily from March to November. Chocablock also opens at other times of the year, please check the website or telephone us before making a special journey.